Pagham, playing without the injured Jordan Matthews in goal, started as possibly the better side, but it all went wrong as early as the 19th minute. Skipper Jamie Horncastle was booked for a late tackle down the right-hand side, and the resulting free-kick was headed over emergency replacement keeper Warren Pye by Matt Mclean to put the away side one up. Three minutes later it could well have been two as a 25-yard curling shot by Uckfield hit the bar and bounced clear. Andy Chick had the Lions' first shot of the game in the 33rd minute, but it spun wide. The last few minutes of the half were played out comfortably by the Uckers. It was Pagham that started the second half on top and Scott Murfin looked to be unlucky when he had the ball in the net just after the interval, only to be given offside. It soon changed though as Bailo Camara burst through a static Pagham defence in the 48th minute to give Pye no chance. It was Pye to the rescue soon after as he saved bravely at the feet of Dee Okojie to keep it 0-2. The Lions made two substitutions on the hour mark and they were soon brought dividends as Liam Brady, on for Alfie Davidson, burst down the right, cut in past his marker and buried his shot into the bottom corner of the Uckfield net in the 70th minute to bring the score back to 1-2. Hope was now rising throughout the Lions team and they deservedly drew level in the 77th minute when Horncastle hit an absolute rocket into the top left-hand corner from fully 30 yards. It all counted for nothing, though, two minutes later, when Matt Mclean picked up a long ball over the top of the Pagham defence, took a few paces forward and blasted home from the edge of the box. Worse followed when first van Driel was sent off for comments he made to the referee and then Scott Murfin was yellow-carded for a similar offence. 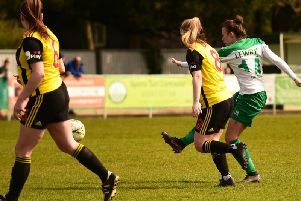 The final straw for the Lions came two minutes into added-on time, when Dee Okojie tapped home from close in, after Pye had saved his initial effort. Pagham; Pye, Wiggans, Wollers, R Davidson, Horncastle (Bingham), van Driel, Chick (Williamson), Prisk, Murfin, A Davidson (Brady). Unused subs: Hands, Hubbard.